Wee, sleekit, cow’rin, tim’rous beastie………..? Well, no. Not exactly. 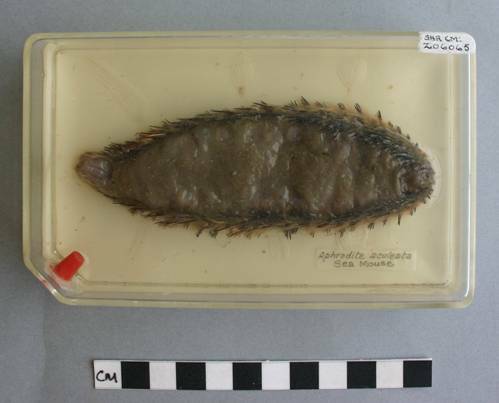 This is a sea mouse from the Fluid Collection. It’s actually a kind of worm but it gets the name mouse because it looks akin to a drowned rat. But look more closely and instead of fur you see clumps of bristles reminiscent of a dilapidated toothbrush. Keep looking and you notice an iridescent greenish hue to these spines. The remarkable thing is that these spines contain hexagonal cylinders which act like optical fibres and give the creature the ability to change colour as a defence mechanism. The sea mouse grows its spines in a similar way to a silk worm producing silk. The sea mouse is an important subject for research by physicists in the field of photonic crystal technology. Amazing that such an apparently humble little creature could be at the heart of scientific developments of the future! Why am I now so interested in this strange animal that I had never even heard of until a couple of weeks ago? After seeing the display in the entrance to the library I felt that volunteering to help with the museum could be something I would enjoy. A background in Primary Education meant I had no particular speciality to offer so I was flexible about what I could offer. Hence I landed up with the Fluid Collection and spent the first few weeks photographing such things as pond weed, slugs, leeches, brittle stars and – a sea mouse! I would come home and see what I could find out about the things I had seen. I am now helping to get the details onto the database and learning about accession numbers and scientific names. I have learnt such a lot in a short time. Who knows what’s coming next?